The Bavarian State Chancellery in the Hofgarten in Munich serves as the official residence of the Bavarian minister-president and plays a pivotal part in the politics of Bavaria – a state of Germany that stills uses its adopted designation as a Free State. 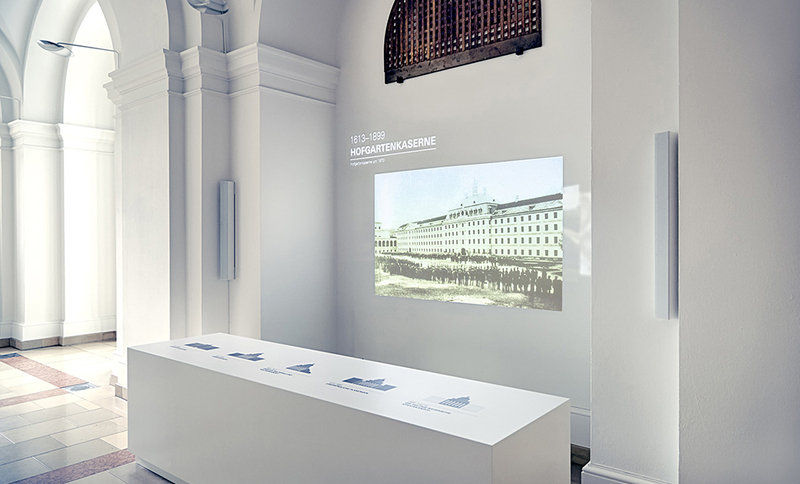 To accompany tour groups and improve the quality of visits to the building, a variety of exhibition units were developed using modern media. 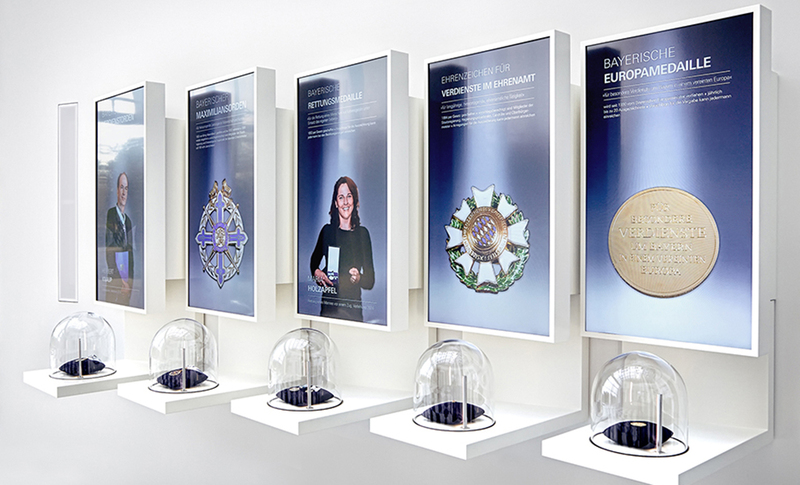 The Orangery building at the chancellery is home to two displays containing awards, medals and honours, all of which have been used by Bavaria to recognise outstanding contributions to the Free State and exceptional examples of social engagement. 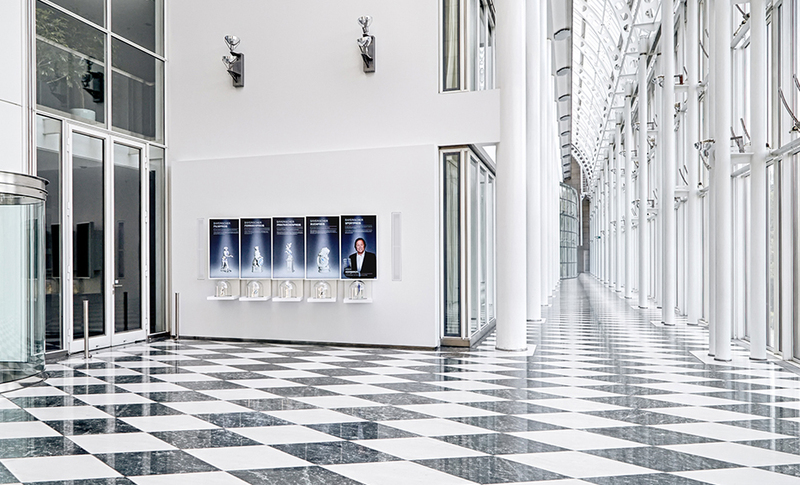 The units offer a combination of original exhibits against a media backdrop showing an introduction to the person who was honoured using audio-visual technology. To showcase each honour with the esteem they deserve, they are positioned under a glass cloche with museum lighting to highlight their unique character. Each honour comes with a monitor in portrait alignment to play more detailed information on the award and place emphasis on the recipient of the honour. Five monitors for each award can be synchronised to show sequences across a larger display area and play excerpts of the award ceremony as well as short statements made by the honouree. 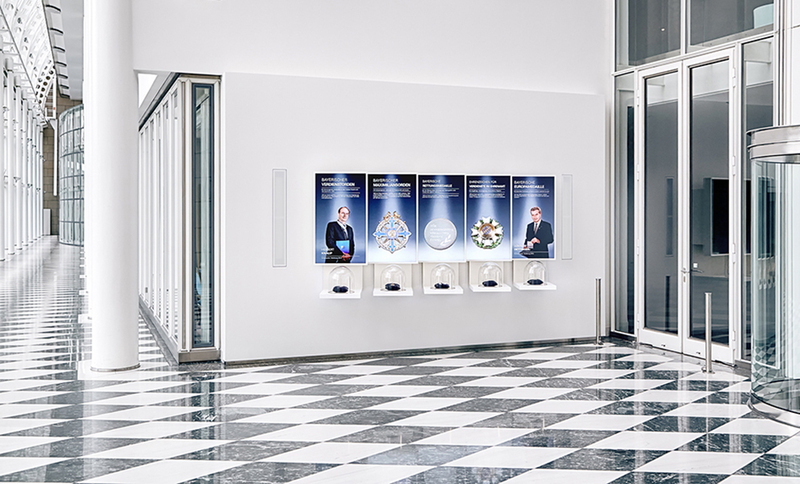 In the vestibule under the dome of the building, there is a media display reciting the chequered history of the building. To support tour guides as they show visitors around the building, large projections show historical events, providing a media narrative of the journey the building has experienced and its different functions over the years.